The Mantis shrimp is a crustacean assigned to the order Stomatopoda. A local name given to mantis shrimp by fishermen is 'thumb splitters' and the name given by ancient Assyrians is 'sea locusts'. The class Malacostraca includes crabs, krill, pill bugs, and shrimp. The subphylum crustacea, consists of lobsters, crabs, shrimp, and barnacles. The Mantis shrimp come in a variety of beautiful colors. God made all the sea creatures on the fifth day of creation including the Mantis Shrimp. Full-grown adult mantis shrimp have been known to grow up to eight or ten inches long. Their body is segmented, long, flat, with a hard shell covering their back so that they cannot be attacked from above. The mantis have swimmerets used for swimming and special filaments and gills for respiration. The chelone are the appendages used to bring food to the mouth. Covering the sides of the tail are uropods and the tail has six sharp spikes. Floating above their head are two flagellated antennae. Mantis shrimp have sixteen different types of photoreceptors including twelve that see color, of which four see ultraviolet light. Four more types detect kinds of polarized light, making their eyes the most complex of the animal kingdom. These animals are the only sea creatures known to use fluorescence to signal one another. The mantis shrimp is equipped to defend its territory with two different pairs of claws - one pair known as smashers, the other as spearers. The mantis claws are so strong they have been known to sever octopus arms. 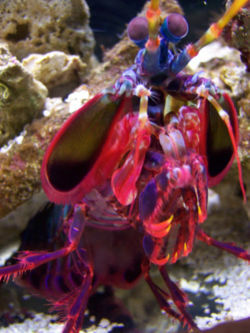 People that have studied the mantis shrimp say they can attack at a speed of 23 meters per second (83 kmph or 50 mph). The high speed smashes snail shells, which are the preferred food of the Mantis Shrimp, and has even broken the glass of aquariums. Mantis Shrimp in its larvae form. The male and female mantis shrimps only perform sexual reproduction. The eggs are developed through the which the male and female produce them and are carried by the anterior legs of the female in its pouch. The mantis shrimp undergo metamorphosis through the following stages: egg, nauplius, protozoa, mysis, post larva, juvenile, sub-adult, and finally adult. The first stage, eggs, just sink to the bottom to lie on the surface of the ground. Most spawning is believed to be in saline oceanic waters. The second stage is Nauplius. There are five different nauplius stages, the first being when they leave the egg, but are limited in their swimming abilities. The third stage is protozoa, when they are slowly starting to develop details such as their mouthparts and their abdomen. The fourth stage of life is mysis. This is where the mantis shrimp begin to develop their legs and antennae. The fifth stage of the mantis shrimp life cycle is the post larval stage. In this stage, the shrimp's walking and swimming legs are small, but getting bigger. The sixth, juvenile, stage is observed to be small and still different from the adults because their rostrum horns are much longer, (though you would think as they got older the horns would get larger). The seventh stage is sub-adult in which they are slowly developing the abilities of a full-grown mantis shrimp. The eighth stage is the sexually mature adult. Science News Online  reports that some Mantis Shrimp species can recognize circularly polarized light. Though some insects, such as bees, perceive linearly polarized light, Mantis Shrimp are the only known creatures to recognize circularly polarized light. They presume the light is used to attract a mate. The mantis shrimp is a solitary and highly territorial predator. When they feel they are in danger the will begin to click their claws together to warn the enemy. They are believed to have a memory span of at least up to a month. The Mantis shrimp are known to be very sneaky and use their keen eyesight to examine their surrounding carefully before venturing out from their hole. The mantis shrimp usually live in tropical or subtropical waters and like to live in the muddy bottom of the lower intertidal zone. They typically build burrows into the mud and rarely have only one entrance.